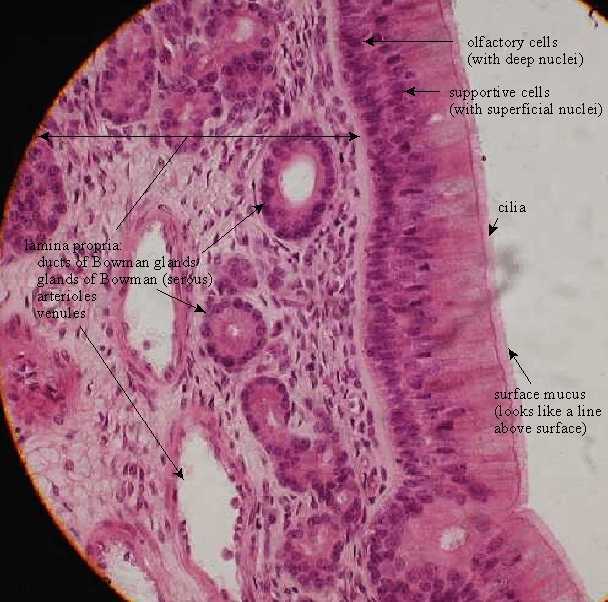 The olfactory mucosa is a pseudostratified ciliated columnar epithelium located in the superior-most region of the nasal cavity, and contains bipolar olfactory cells whose cilia are embedded in mucus. Chemicals which dissolve in the mucus trigger responses in these cilia which initiate a nervous impulse, interpreted in the brain as an odor. Supporting cells surround the olfactory cells. 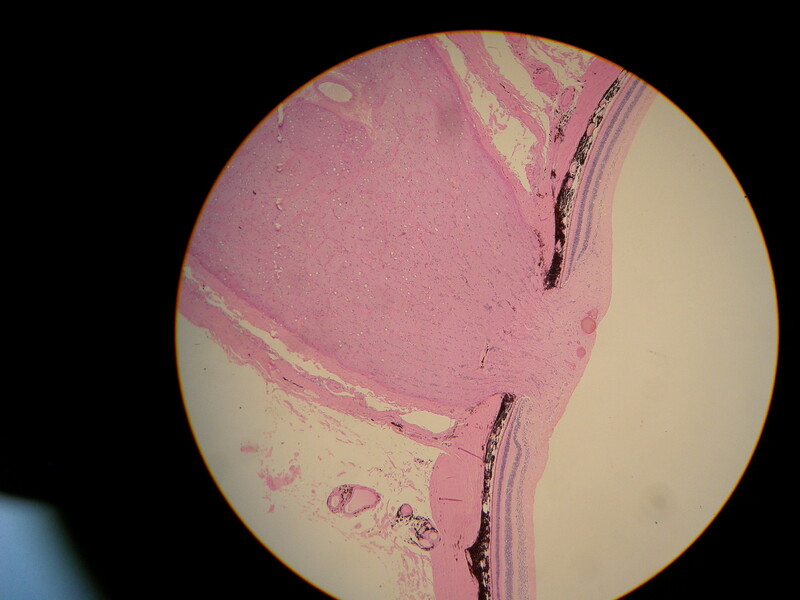 Mucus-producing Bowman’s glands are embedded in the lamina propria. 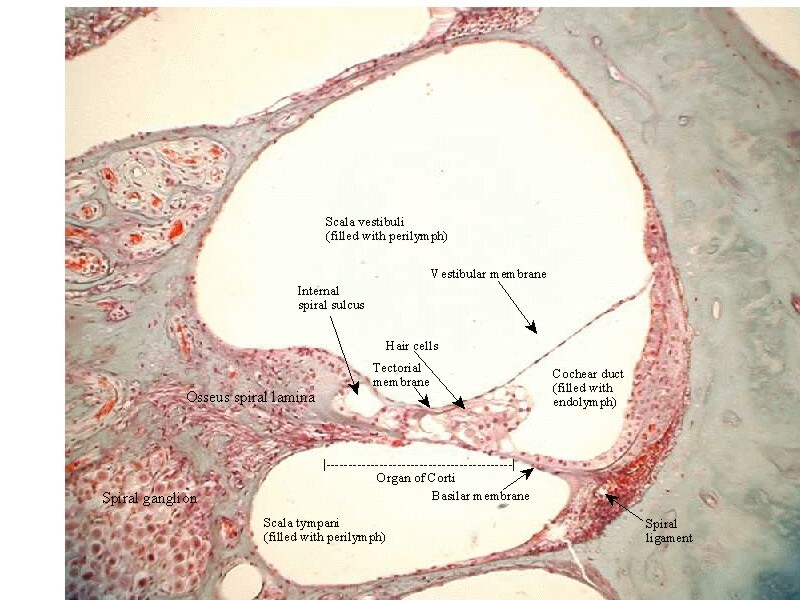 This connective tissue is richly vascularized. 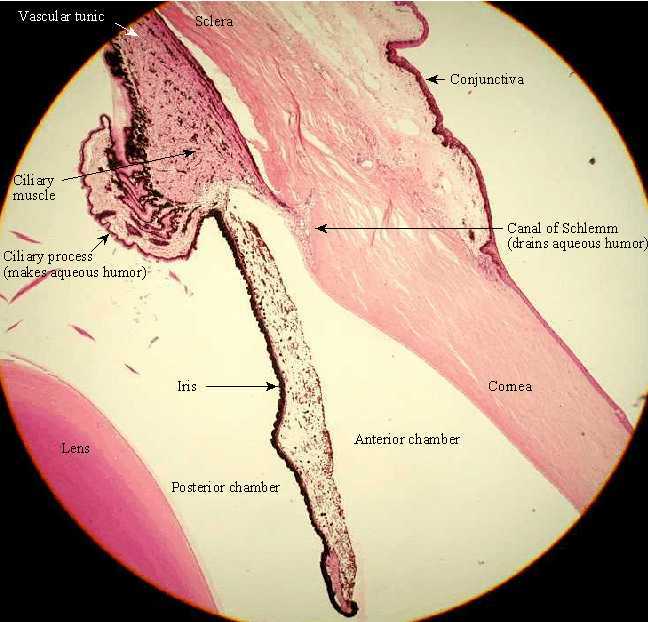 Some slides have portions of the cribriform plate of the ethmoid bone included. 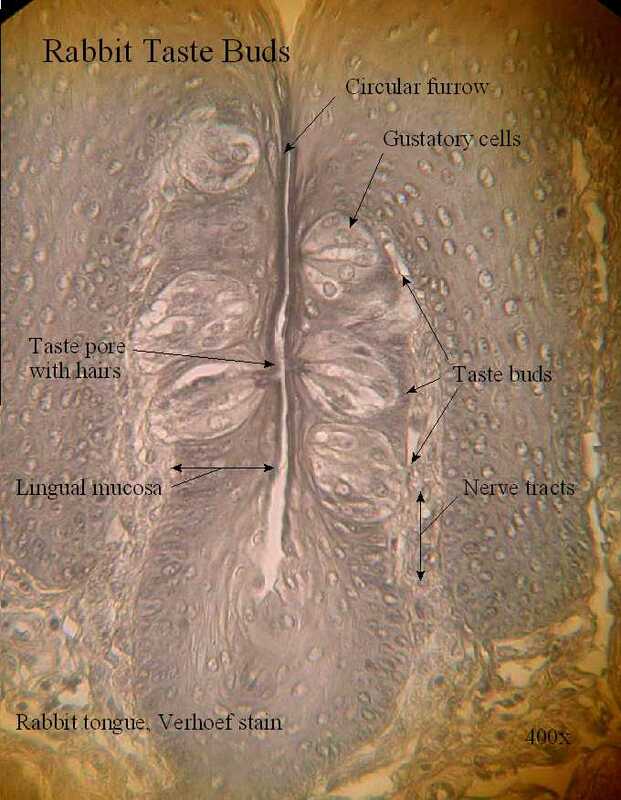 Here is a labeled version of the taste bud, Verhoef Stain, 400x, . Pressure detection: Pacinian Corpuscles in the pancreas: Pacinian corpuscles are specialized nerve endings which detect pressure and vibration in an organ. 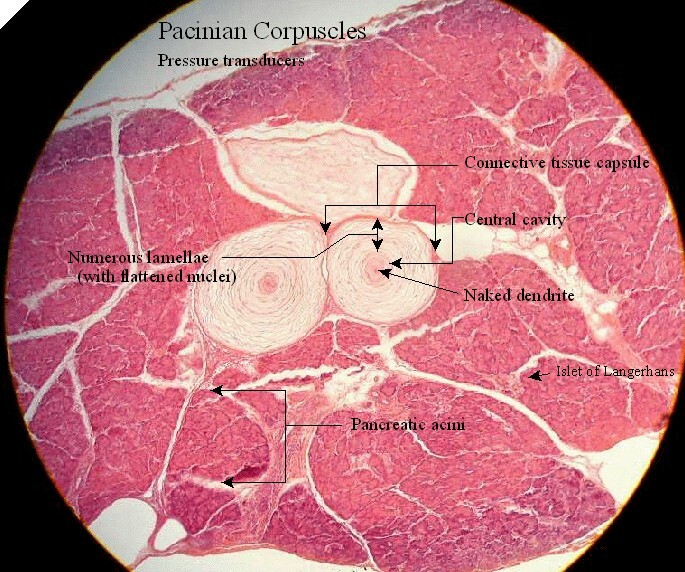 Here is a labeled view of Pacinian corpuscles. Above left are the three ossicles photographed with a dime to show their relative size. The left most bone is the malleus (hammer) which is attached directly to the typmanic membrane. It transmits vibrations to the incus (anvil) which in turn transmits vibrations to the right most bone, the stapes (stirrup). The flat end of the stapes fits into the oval window of the cochlea which then transmits vibrations into the cochlea along the scala vestibuli. Examine the following two slides, note the features in common and the differentiating features. Illustrate each at the noted power to take up a page. 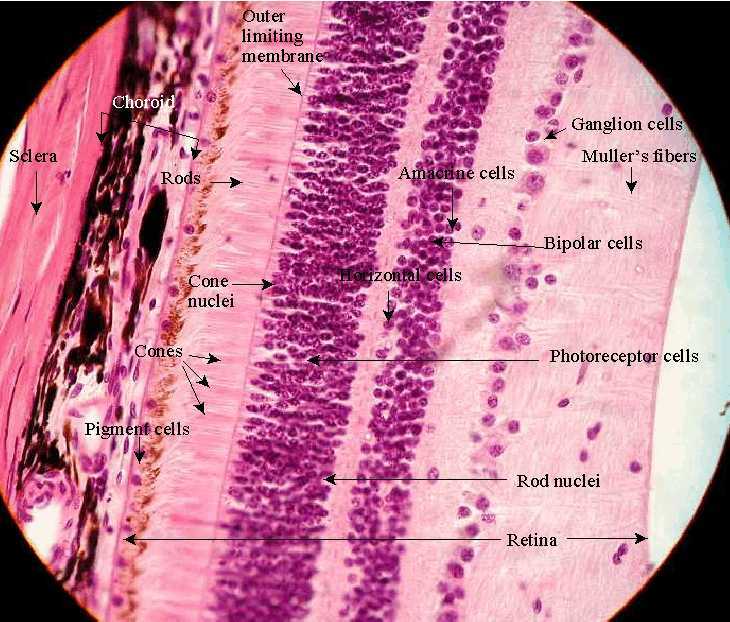 Compare with the illustrations in di Fiore’s Atlas of Normal Human Histology, 9th Ed. Here is a labeled view of the 40x view including the cochlear nerve. 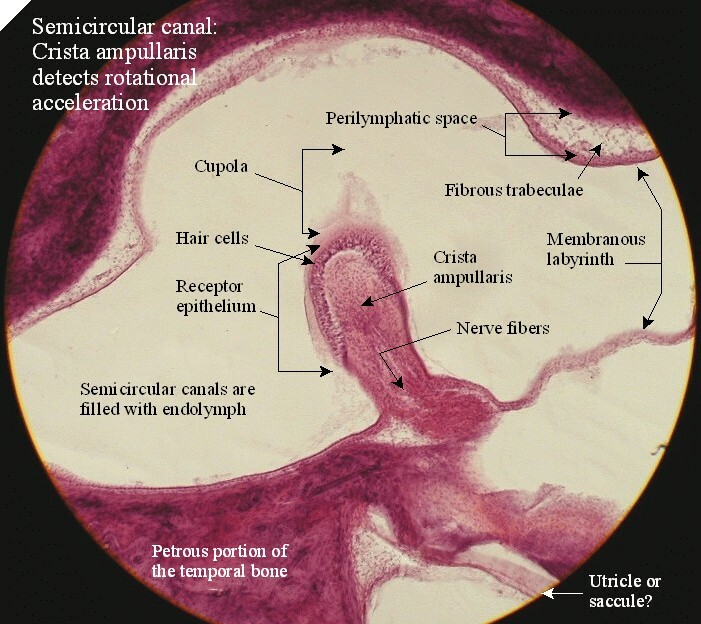 cochlear duct Here is the image labeled . 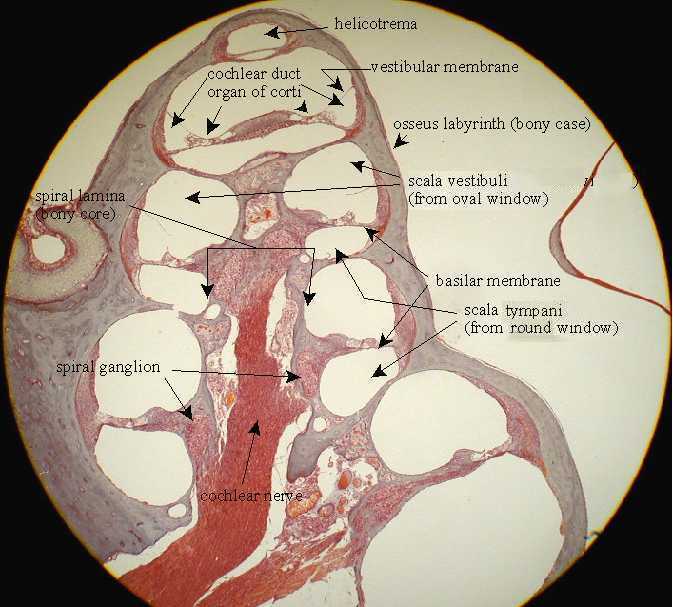 membranous labyrinth Here is a labeled view of the crista ampullaris. Hair cells can be made out. 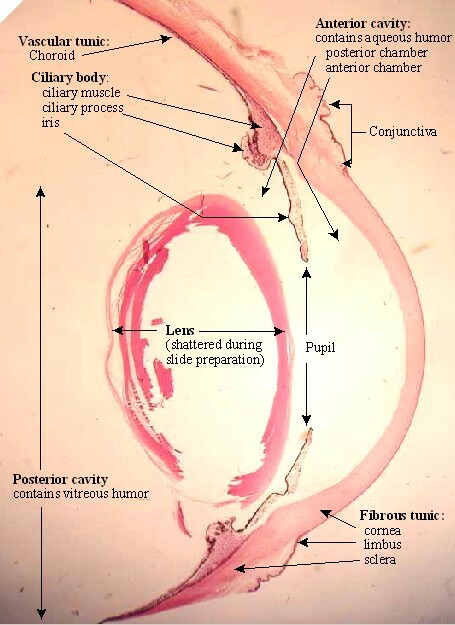 Here is a labeled view of the anterior portion of the eye. 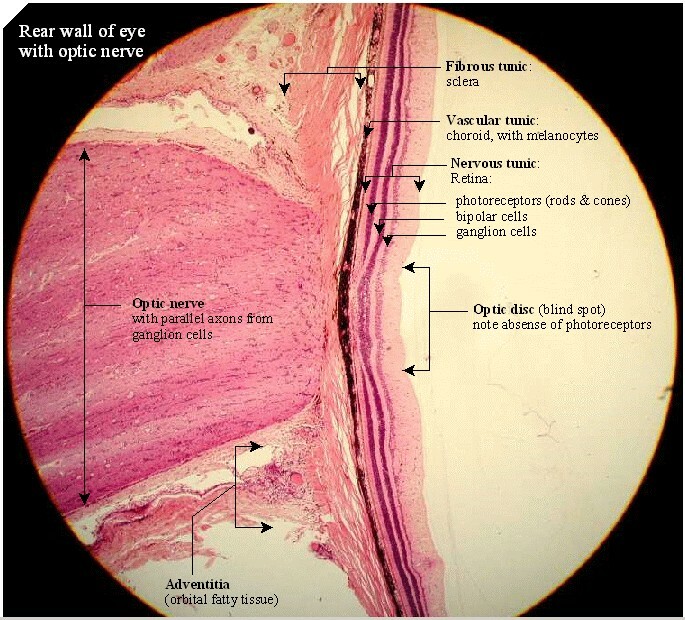 At 100x: cross section through rear wall of eye with optic nerve: Here is a labeled view of the rear wall. Here is an extraordinarily good image of the blind spot where the optic nerve exits the rear of the eye.